The range of sensors from Netshield include active -, digital- and analog sensors that will detect and respond to some type of input from the physical environment. This include detection of light, heat, motion, moisture, pressure, or any one of a great number of other environmental phenomena. Active and passive sensing technologies are both used in remote sensing to make observations and measurements from a distance or on a scale beyond those observable to the naked eye. Sensors can also be used in harsh environments and places that are inaccessible to people. 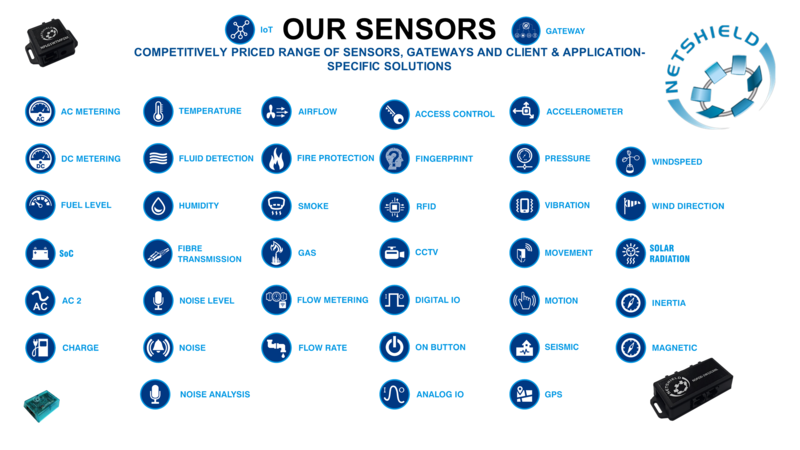 Active sensors are also widely used in manufacturing and networking environments for example to monitor industrial machines or data center infrastructure so anomalies can be detected and components can be repaired or replaced before they break and shut everything down. There are various types of analog sensors; practical examples of various types of analog sensors are as follows: accelerometers, pressure sensors, light sensors, sound sensors, temperature sensors, and so on. Electronic sensors or electrochemical sensors in which data conversion and data transmission takes place digitally are called as digital sensors. NSPOD-1WI2CANL Universal Sensor POD with Power feeding through RS485 communication interface, 1-Wire, I2C digital, Resistive Analogue (Flooding). NBAR-I2C-POD Relative humidity Sensor, Humidity range of 0 – 98% in 0.03% increments, POD Powered. Manual or Auto Switch position. The Fire Panel must be within 50meters of the server room with existing, easy, accessible and safe Cable routing path. existing, easy, accessible and safe Cable routing path. and Fuel Low Contact. The Generator must be within 50meters of the server room with existing, easy, accessible and safe Cable routing path. NGENI-RF250M ISM Wireless Generator Management Contact Monitor with RS485 NSP1 interface, 4 NO/NC Outputs, 4 Digital Inputs and 2 Analog – 250 meter clear line of site operation. NGENI-RF1KM ISM Wireless Generator Management Contact Monitor with RS485 NSP1 interface, 4 NO/NC Outputs, 4 Digital Inputs and 2 Analog – 1KM meter clear line of site operation. NPOD-FDRDFS-CM3 Remote Cabinet Probe/Protocol Converter powered from either 12VDC or Phantom Powered through main upstream RS485 interface with Remote RS232, I2C, 1-Wire and Wiegand interfaces. Analogue Flood Sensing input. Dual, front and Rear, door control sets – including door open output, door open/closed sensor input and light Switch output (per door). NRMIO-4I-4O-2AN Remote IO direct RS485 wired connection to 4 NO/NC Outputs, 4 Digital Inputs and 2 Analogue inputs with selectable address and Phantom powered.